Easy, breezy, freezy. 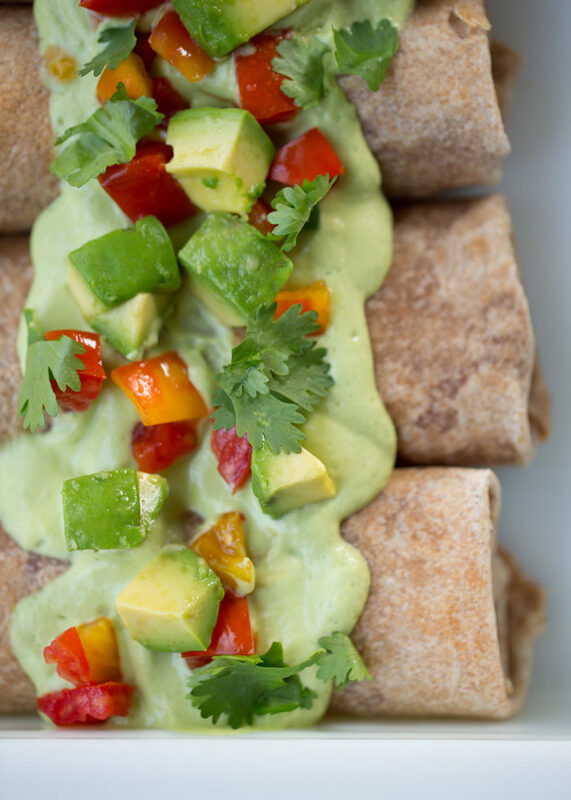 Roll up a few burritos, bake ’em up, and eat them now or freeze individually for super-easy lunches and dinners down the road. This flexible recipe can be made vegetarian, carnivorous, or vegan to satisfy every eater. 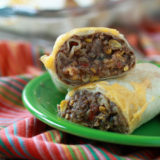 Ever since I made a huge batch of these refried bean and cheese burritos, wrapped them in foil, and threw them in the freezer, coming up with lunches has been a breeze. I can only spare five minutes to wolf something down? Go to the freezer. Grab a burrito. No leftovers for my guy to take to work the next day? Grab a burrito. Simply craving a ridiculously delicious lunch? Grab a burrito. In fact, “grab a burrito” may just be the answer to all of life’s problems. Not sure which preschool to enroll your toddler in? Grab a burrito. Seeking world peace? Grab a burrito. Okay, so it may not solve everything. But when you’re eating one, it kinda feels like it. This recipe is so, so easy you almost feel guilty. I think that kind of recipe is the very best kind. So here’s what you do. Break out a big bowl and stir together some refried beans (I usually use my homemade Crock Pot version), cooked brown rice, your favorite salsa, a can of green chilies, a little corn, and some shredded cheese if you like. 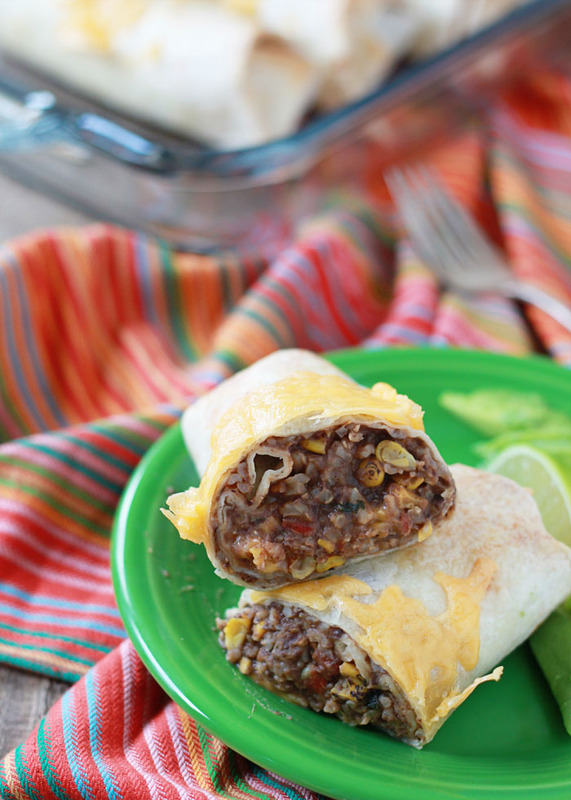 If you’re making meatless burritos, you’re done with the filling! Wasn’t that easy?! Or you can break some out, if you want, and add a little cooked shredded chicken to a portion. Then just plop a bit of the filling onto a big flour tortilla, wrap it up, and lay it in a pan. Repeat a few times, sprinkle a little cheese on top, and bake. Now that I’m dairy-free, I make a vegan filling for myself. I simply leaving out the cheese and, of course, omit the chicken. Sometimes I’ll add 1/2 teaspoon of cumin and a pinch of salt to amp up the flavor, then, if I’m serving them right away, I smother ’em a bit in a creamy vegan sauce and some veggies. Eat ’em now, eat ’em later. 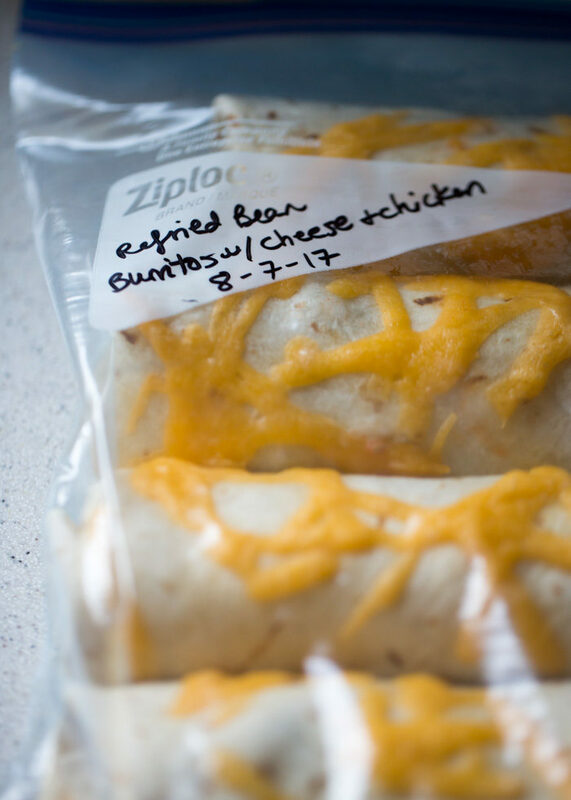 To freeze, you can either add them to a freezer bag as-is for shorter term or, for longer, wrap individual burritos in foil and mark them with a Sharpie. To thaw, you can reheat in the oven, on a grill, over a campfire (we’ve done this!) or, of course, in the microwave (about 2 minutes on high). And whenever you do eat them, try a little avocado, some salsa, maybe a little sour cream on the side. Or straight-up! Seriously delicious either way. 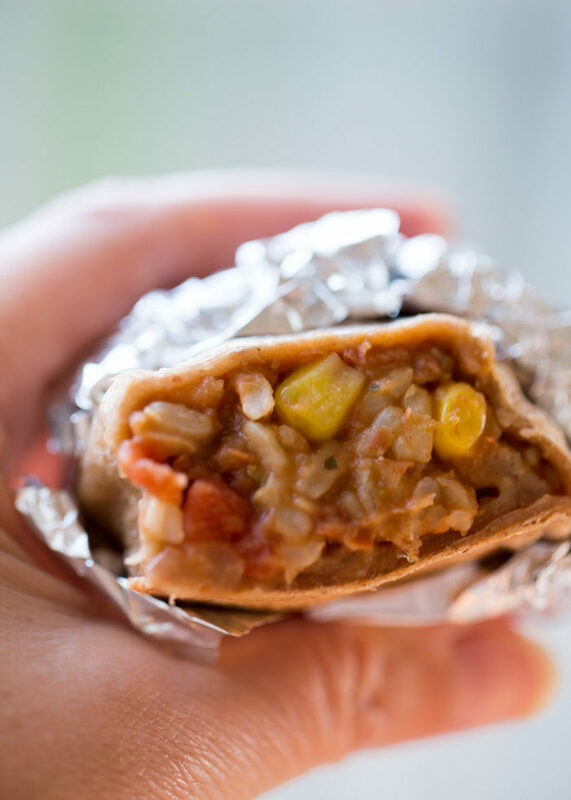 And you’ll soon learn, when a bevy of these burritos are in your freezer, you’ll feel like you can conquer the world. If life give you lemons, you’ll know what to do. Eat a burrito. In a large bowl, stir together the refried beans, brown rice, salsa, chilies, corn, and 1 cup cheese. If adding chicken to half, move 3 cups of the mix to a separate medium bowl, add the chicken, and stir. If making a vegan filling (without cheese), add 1/2 teaspoon cumin, 1/4 teaspoon kosher salt, and 1/8 teaspoon pepper. Taste and add more seasoning if desired. If the tortillas don’t seem pliable (likely to rip when you bend/roll them), place tortillas on a large plate and cover with a damp dishtowel. Microwave on high for 30 seconds to steam the tortillas. One at a time, lay the tortillas flat and place 1/3 cup filling just below the center. Fold in the sides of the tortilla so that they nearly touch, then bring up the bottom of the tortilla, pulling the contents tight, rolling the burrito from the bottom upl, and keeping the sides tucked as you go. For more guidance, here’s a terrific piece from The Kitchn on how to roll a burrito. 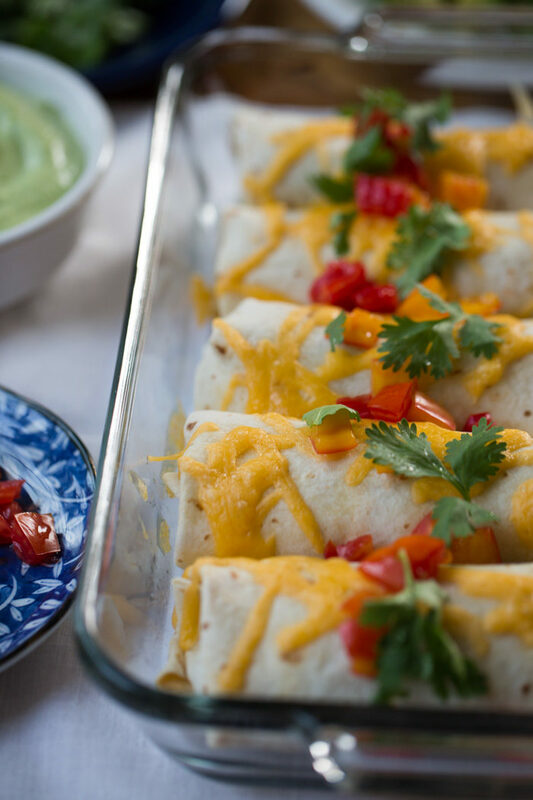 Lay the burritos side by side in a 9-inch x 13-inch pan (or, if you’re making a meaty version and a vegetarian version, keep them segregated by using two 8-inch by 8-inch pans). Sprinkle additional cheddar cheese over the top (omit for vegan version) and bake for about 20 minutes, until heated through, cheese is melted, and they’re starting to turn golden brown. Serve. * If you’re a vegetarian, make sure you use vegetarian (lard-free) refried beans and lard-free tortillas. 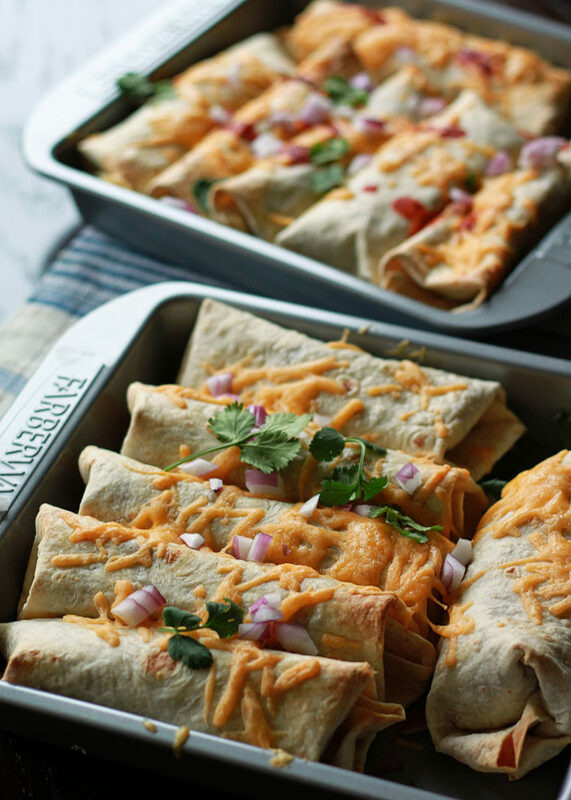 Let cool and wrap individual burritos tightly in foil to freeze. To reheat, remove foil and wrap loosely in a paper towel. Microwave on high for about two minutes, flip, and cook for another minute or so until heated through. These can also be reheated on the grill or even over a campfire (keep them in the foil)! I’ve also plopped these directly in freezer bags for shorter-term freezing. Another make-ahead option? 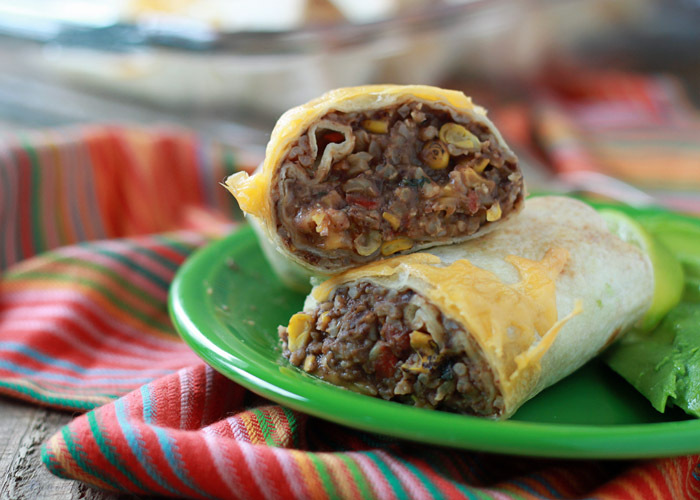 Make the filling ahead of time then assemble the burritos later on. The filling lasts in the refrigerator for about 3 days, or freeze in a freezer bag for several months. Originally shared in February 2014; updated September 2017. Love your blog and recipes — I’m in a similar household. 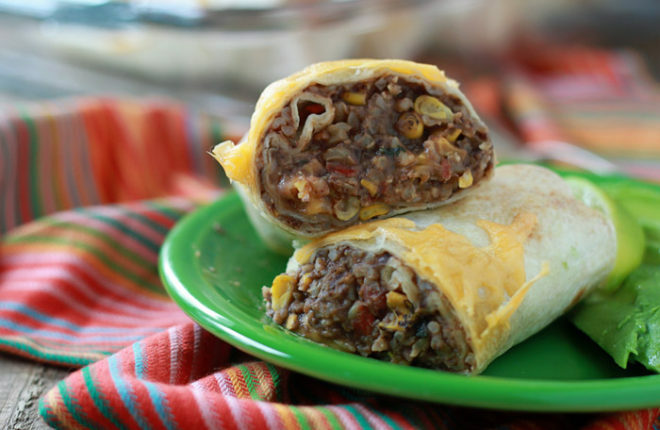 For the burritos, have you tried or do you have suggestions for getting more healthy veggies in there easily? I’d love to see colorful peppers, zucchini, squash, etc. I really think you could throw just about anything in the filling. I usually add some bellpeppers, both red and green. Maybe add a little carrot, julienned or chopped depending on how crunchy you want your burrito. But I really feel that the sky is the limit! I am going to try this with kale, red cabbage and roasted butternut squash to up the veggie content! Can I come over for dinner that day? 😉 Sounds wonderful! I did not have corn, so I used green beans. Turned out very good. I think you can use just about anything you like in the filling. I love the veggie dish. I also used mashed red kidney beans, instead of refried beans. Thanks for the lunch idea! For how and at what temp. would you recommend re-heating these in a conventional oven instead of the microwave? Just moved off to college, and these are a life saver! Super easy to cook and reheat well! they really could cause world peace! Can these be frozen and reheated in a microwave? These are so good for leftover veggies, meat, etc. I also found this recipe in a vegan camping food ideas site. Thank you for sharing some of your creativity with us!